Taylor Hatcher Sports Therapy offers three types of bike fitting for every level of cyclist. Weather your a recreational cyclist or an experienced or current bike racer your bike fit is how you and your bike communicate. Chronic Pain, numbness, and saddle sores are a few of the ways your bike says, "we need to talk." Every bike fit available from bike shops to gyms to pro cycling fit studios approach bike fitting the same way. They know a ton about the bike works ad very little about how your body works. The application of our understanding of human movement to bike fitting creates a stable and powerful ride. We assess how you move on and off the bike and dial you into the optimal position for your body structure, limitations, strengths, and goals. Our method facilitates a neutral position of high stability and power output for all levels of cyclist. This is our featured professional bike fitting service. The application of our understanding of human movement to bike fitting creates a stable and powerful ride. After we assess how you move on and off the bike, we dial you into the optimal position for your body structure, limitations, strengths, and goals. Our method facilitates a neutral position of high stability and power output. We help all levels of cyclists and encourage anyone who cycles to get a proper fit. Discover - Understand how to stop and prevent pain by assessing on and off the bike. Body First - Know your body's boundaries instead of defaulting to the bike's boundaries. Feedback - Receive feedback from a whole systems perspective and make a plan with our suggestions. Our full body approach results in a stable, powerful and pain free ride. So you bought a bike, you did your research, test rode a couple bicycles and made a final decision. Congratulations! Did you get a "free bike fit" from your local bike shop? You have probably rode your bike a handful of times and experienced some kind of discomfort. Maybe you bought a new saddle or stem to change your position and alleviate some pain and discomfort, yet the discomfort persists. What you're experiencing is an improper bike fit in some form. The typical bike fit process forgets to take YOU into account, with little more than a static flexibility test. Our full body approach picks up where typical bike fits and pro bike fits leave off. We apply our unique understanding of of dynamic alignment and human movement to your bike fit resulting in a neutral, stable, and powerful ride for all levels of cyclists. 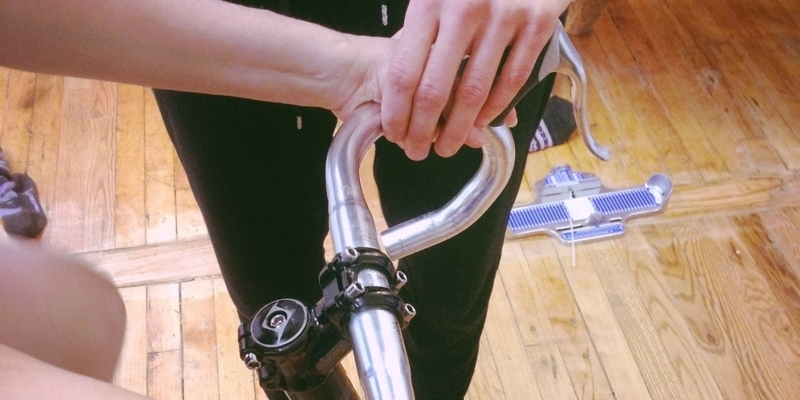 You're no stranger to a bike fit. Weather you had a bike fit at your local bike shop or at a professional bike fit studio, you haven't found that perfect pain free position. An injury, crash, or chronic pain are all perfect reasons to tweak your fit. You are not rigid like the bike, as your body changes so should your fit. Saddle sores, chronic pain, and numbness are not a normal part of riding a bicycle, not matter how much or little you ride. You simply haven't found the right position. We will apply our full body dynmic alignment method to your exiting fit, and make suggestions for changes based on your unique body movements. Why should I get a bike fit? Unlike other sports, cycling locks your body into a ridging position, confining you to the same repetitive motion. Because you're locked in the is rigid position, your are stressing a specific muscle group. A bike fit makes sure the stress you are putting on you body is targeting the correct muscle group, keeping your from destructive chronic pain syndromes. Not only will the correct bike fit keep you pain free, it will also be your most efficient, therefore most powerful position. How is a Taylor Hatcher Sports Therapy bike fit different from other bike fits? THST takes the basic building blocks of bike fit and expands upon them by introducing her Dynamic Alignment Method. It's the only bike fit that take a deep look into your whole body dynamic alignment method. Conventional bike fits and the top of the line 3D motion capture don't take your whole body movement into consideration. Our Dynamic Alignment Method is the only full body understanding on the market and in the bike fit world. Which kind of bike fit is right for me? There are many factors to consider when choosing which type of bike fit is the right fit for you. When choosing a bike fit, the most important factor to consider is what kind of cyclist you are and what kind of cycling you would like to get into. If you are a recreational cyclist, finding a bike fitter that does not specialize in a pro bike ft, is very important. Finding the right bike fitter that takes your specific body alignment into consideration. If possible look for a bike fitter that has experience as a physical therapist or a massage therapist, this will ensure a deeper level of understanding of the body. A deeper level of body understanding will ensure a more precise fit to your bike, and more consideration to your unique movement patterns. A deep understanding of your full body movement is what is missing from the typical bike fit, pro bike fit and your local bike shop. Taylor Hatcher Sports Therapy located in the Chelsea neighborhood of Manhattan New York offers multiple sports therapy solutions for athletes and non athletes. Alternative therapies like sports therapy, bodywork, massage therapy, pro bike fitting, bike mechanics, coaching for runners, coaching for triathletes, movement classes, dynamic alignment classes, running basics classes. We have the best sports therapists and pro bike fitters in NYC. Our alternative full body approach to bike fitting, is a one of a kind pro bike fit for professional cyclists and cyclists of all levels of cyclists in New York and beyond. Taylor Hatcher runs New York's best and only Manhattan sports therapy and bike fitting studio of its kind. She coaches runners, cyclists, swimmers, athletes, non athletes, and triathletes of all kinds. She is an elite running coach and triathlete coach in New York, offers pro bike mechanics, pro bike fitting all in Manhattan, New York City. Our New York sports therapist specialize in bodywork, massage therapy, sports therapy, bike fitting, bicycle fitting, running coaching, cycling coaching, triathlete coaching, movement classes, dynamic alignment classes, dynamic movement, runners training, cycling training, and triathlete training.